I thought I’d take a trip into soup world one more time, and have for you, an original recipe for a luxurious soup that’s guaranteed to impress. French Onion Soup is one of my favourite things to eat. I’ve always been amazed by the transformation that takes place as an onion changes from something strong and bitter, into something incredibly sweet and delicious. sauce-making. I’ve never seen a shallot soup on a menu, so I thought, why not try one myself. was being eaten on screen at Keller’s restaurant, The French Laundry, where dinners cost upwards of $250 per person. complements the sweetness, so as not to make everything sickly sweet. 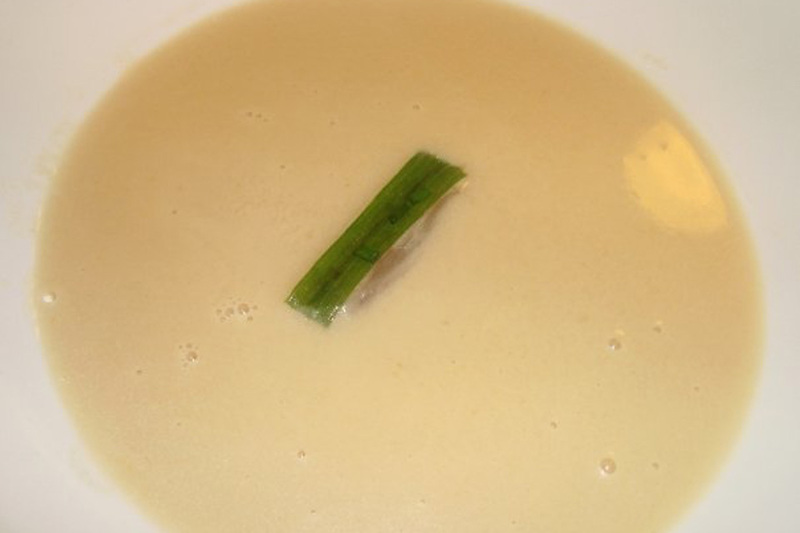 By straining multiple times, the soup is left silky smooth, and the garnish adds some freshness, and a nice variety of flavour. put the shallots in the oven. a little bit, but not much. of butter, over medium heat. Cook for 5 minutes, stirring occasionally. reduce to a syrupy texture. This should take approx. 2 minutes. white wine), and reduce to a syrup. This should take approx 2-3 minutes. gently to move the liquid around. Reserve the soup. down), and salt in a small pot. simmer gently for 4 minutes or until a texture you enjoy. salt, and pour into a bowl.